Nowadays, being environment-friendly and eco-conscious has become an amazing trend. People are becoming more aware that resources are ending and pollution is turning into a health hazard. This is why it’s great to see dentists deciding to go green, but green solutions can be confusing to distinguish and implement especially when you try and filter all the options you have. There are a lot of grey areas if an environmental product or plan is really eco-friendly and you can easily feel overwhelmed at choosing the right plan for you. We are here to simplify things and make planning your eco-friendly office as easy as possible. Here are some tips that can help you with this. Many dental offices give patients a dental care packages before they leave. Most of these are carried in plastic container or something similar. Let’s try to reduce that type of packaging by trying to purchase ones that are made of biodegradable packaging. Biodegradable material helps reduce added waste. “The 3 R’s of the environment” is a classic saying for years now and most people already know how to reduce, reuse and recycle. Not a lot of people are aware but you practically reuse almost anything. A quick search on Google can shed some light on the process. The best choices of equipment are obviously the ones with the highest quality. It may sound counter-intuitive but think of it as an investment. You already know that the latest equipment can be expensive, but think about what may happen if you buy the cheaper options. This cheaper and non-upgradable equipment either wears out too quickly or becomes obsolete in a few years and will force you to buy a better version. The newer equipment also usually comes with an energy saving feature that helps reduce power and water consumption. 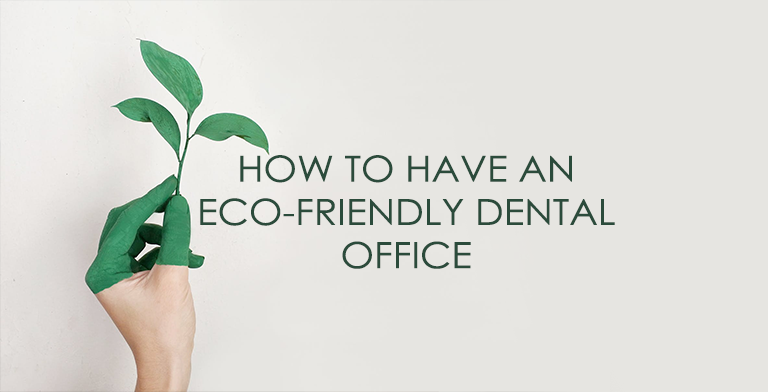 If you can commit and integrate these successfully, you are well on your way to a more eco-friendly dental practice. The trick here is to start small.